Volleyball posts are used for a standard court that is 30' x 60' with the net 32' wide - sleeves for posts are set 33' or 34' apart. Smaller areas can be used but the net must be cut to size. The key is to have your sleeves sunk with the caps on so they will be flush with the surface when placed. Men's volleyball posts are set 8' tall while women's posts are set at 7'4" tall. Combo posts for volleyball, paddle tennis, and badmidton play. Note the two pulleys that the cable and ropes go over for volleyball and paddle tennis nets. Volleyball posts can have a cleat or a winder to tighten off to . #3042 SLEEVE SET: Hand made sleeve set to take 2 3/8" posts. The sleeves are 18" deep and come with caps. If you set the sleeves and paint with the caps in, you can have a flush surface with matching caps. #3041 VOLLEYBALL POSTS: Handmade volleyball posts with pulley, winder, and tie off points. A standard court has posts 33' apart. 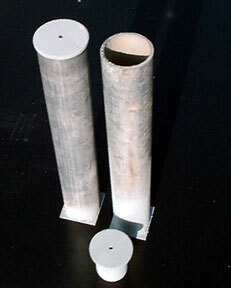 We make our posts from 2 3/8" pipe and set the height to 8' for men's play or 7'6" of women's play. #3043 COMBINATION POSTS: Handmade volleyball, paddle tennis, and badmidton posts for sports courts. Call to discuss options. See top picture. 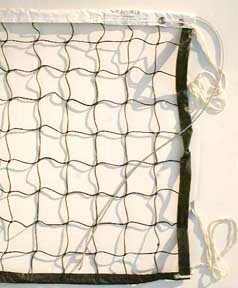 Note# Also comes in 21'6" wide with a rope cable for paddle tennis courts. #2030 SUPREME VOLLEYBALL NET: A net for college and professional play because the net has two cables for both the top and bottom of the net. The net is 32' long and is only for posts with two winders. Also called a VB 1500. Prices as of 3.4.2018 Prices subject to change without notice so call to confirm a quote. Many additional items and colors can be supplied but shown is what we always have in stock. In business for twenty-six years so we know about longevity and odd problems. Not all items are listed and additional fabrics can be used - ask if you do not see what you need.